Today was the first day of summer holidays for hubby and we trotted off to the newly opened Toitu - Early Settler's Museum. I posted about it's temporary closure whilst it was being revamped here. My first impressions are Wow!!! Just Wow!!! Now it is no secret that I love museums and I love history even more, so it was always going to be a hit with me, but this is the best experience I've ever had at a museum. Leaving the spacious yet welcoming foyer - encompassing a cafe and the old steam engine, Josephine - we were welcomed by a large 3D movie of the beginnings of New Zealand. An old photograph (circa 1860s) was given the 3D treatment with the bonus of a moving tram. It was amazing to see a piece of our history come to life. I could go on and on about everything I saw, but I think it will be much kinder to you if I just point out a couple of my favourite exhibits. I will be returning again (and again, and again and ....) so you will be hearing more from me in later posts, no doubt. The first exhibit that wowed me was a replica of a wattle and daub cottage, built in the exact same way as it would have been in the 1850s. Heres an old photo that appeared in our local paper, the Otago Daily Times, which is what they used for inspiration. The end wall - far right - was missing and you could walk in the front door or enter through the side. 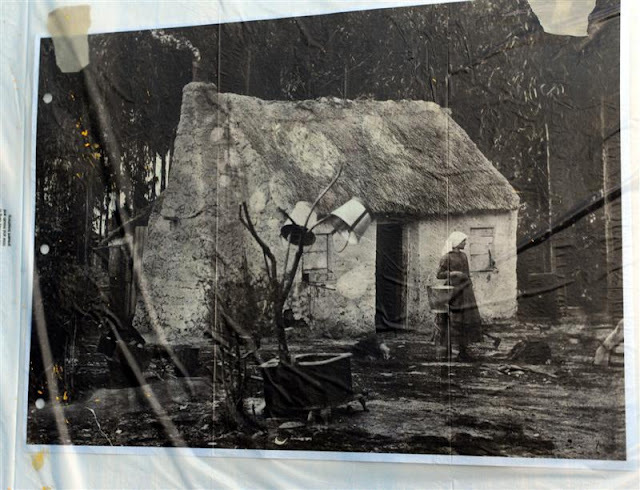 It was furnished just as it would have been back in the day: rustic bed made from branches tied together, tree stumps for seats, a butter churn, hessian curtains, the family bible, and a sound recording of a mother and baby. And you could pick up and touch everything inside. I really felt as though I had been there. The other exhibit evoked a strong sense of nostalgia. 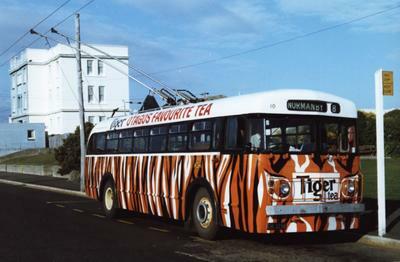 Dunedin had trolley buses until 1983 and the most memorable was the Tiger Tea bus. Here's a photo of it on one of its last runs. Thirty years ago this was the bus I caught to work! Entrance to this exhibit was via the back door of the bus and it was such a treat to sit again on the leather seats and rub my fingers over the wooden panelling. But even more exciting was that the front of the bus was a huge tv screen showing a film of a driver and passengers who conversed about topics circa 1980s and they were traveling along my old bus route! It was just like riding that bus again, and yes, I shed a nostalgic tear. The afternoon was finished off nicely with coffee and cake, whilst taking in the view of the Railway Station and the hills beyond. When hubby asked what I thought of the museum, my response was, "I want to move in!" If only it were summer here in the United States. Great blog post and info. Hi Anthony, thanks for stopping by. I hope it's not too cold where you are.